You'll be surprised at just how good such a cheap speaker can sound. Ultimately, though, it lacks bass for standalone hi-fi use. This little speaker is as cheap as it is tiny. Can something so small deliver true hi-fi sound? Ten years ago, the £99 per pair 'miniature' loudspeaker was a major part of the British hi-fi scene. Times change, prices crept upwards, and the budget sector went into a slump. Almost overnight, the £99 miniature seemed threatened with extinction, and it must be a good many years since such a speaker came the way of this reviewer. It therefore came as something of a surprise to receive this sub-miniature from a new but thoroughly serious brand sailing just under the £100 barrier by costing precisely £99.90. Q Acoustics is part of the Armour operation, a budget-oriented specialist hi-fi group that brings together such well-known brands as QED, Alphason, Myryad and Goldring. 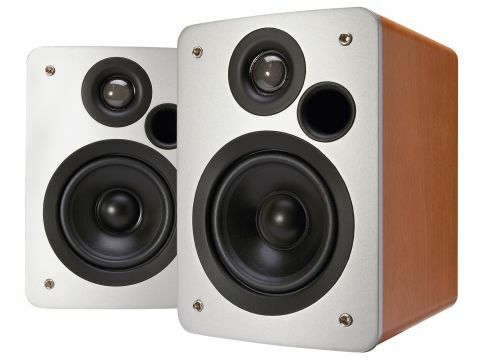 Armour used to distribute Mission's budget price M-series speakers, but when Mission changed hands in 2005, Armour decided to develop its own Q Acoustics speaker brand instead. The initial launch covered four stereo pairs, plus home cinema-oriented extras. The largest, the £330 per pair 1050 clearly offers exceptional material value for money. The same is obviously true of this 21.5cm high 1010 baby, and the reason why these two offer such a lot of speaker for relatively little money has everything to do with ultra-competitive Chinese manufacturing costs. Put these together with design and engineering expertise from Armour personnel and consultants and you get a combination that's difficult to beat. At 3.4 litres of enclosed volume, the 1010 is just half the size of the stereotype miniature, and features an appropriately tiny 100mm main driver with an 80mm doped paper cone. Port loaded in the front, the tough little 15mm MDF enclosure, finished in cherry, beech or black vinyl woodprint, has no need for extra bracing. The wrap edges are nicely post-formed, and the inside is lined in longhair wool. The front panel has an extra 12mm layer, and the 25mm soft dome tweeter is rear mounted into the front layer. A single terminal pair feeds the signal in via a fourth order crossover network. One can hardly expect such a small speaker to offer much in the way of bass extension or sensitivity, but the overall compromises adopted here seem to be very well judged. Indeed, our measured sensitivity is actually a close-to-average 88dB, and some 2dB above the 86dB claimed in the specification. Bass extension is inevitably limited, because the port is tuned to a relatively high 65Hz, but the impedance stays above four ohms throughout, so the load the speaker presents to the amplifier is not unduly demanding. While free space siting does provide the best imaging and a marginally superior midband balance, it also leaves the lack of serious bass output all too obvious. The best solution is probably to use a subwoofer, perhaps unsurprisingly given the company's home cinema footing. However, placing the speakers close to a rearward wall proved very effective in boosting the midbass at least, even though low bass remains well beyond its capabilities. And if wall proximity renders the broad midband a little less even in consequence, it still passes muster and stays within good limits, while delivering decent bass output down to 50Hz, and stereo images remain well formed. The dimensions confer positive benefits, and this speaker's low cabinet coloration is very audible and praiseworthy. Indeed, despite the price and size, in no way is this speaker one to take lightly. It is beautifully voiced through the broad midband and presence region, bringing fine expression and intelligibility to speech as well as song lyrics, yet with sufficient restraint to avoid unwanted aggression. The treble is also very nicely judged, if lacking a little sweetness. Although the sound isn't particularly smooth or even, it actually does better than the bigger 1050 in this regard. Ultimately, of course, loudness capabilities and dynamic expression are limited, especially when playing material with a heavy bass content, and this limitation will be compounded when vinyl, with its heavy subsonic output, is the source of choice.